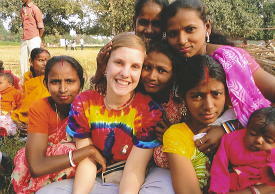 A report from Natasha Kubik about her mission to India in January 2011. 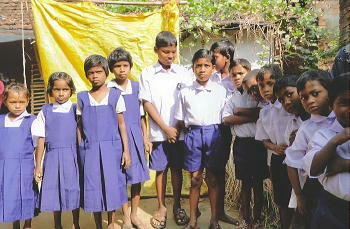 Thank you so much for the generous donation that you made for my trip to India. Recently, I arrived home from Kolkata, India where my team, Colin Larnerd, Jorden Eck, Mar Peter-Raoul and I had the privilege to spend time with 43 children and families that live half in the Shree Durga Dump and half in a small village outside of the city. The families rotate every 6 months. 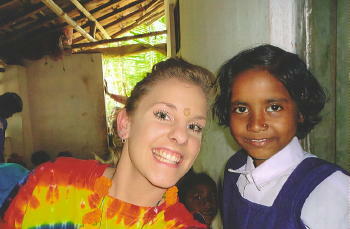 The trip was truly an eye-opening experience and certainly life-changing. 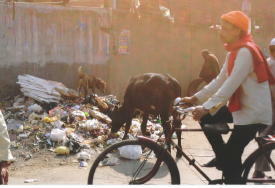 India is very overpopulated, very dirty, and pretty much completely insane. Walking out on the streets everyday was very mentally draining. There were hundreds and hundreds of people begging for money and sleeping on the streets at night. There were a lot of homeless dogs just roaming the streets, scrounging around for food. Their diet consisted of rats, crows and garbage. It was very sad. Our plane was delayed by the snow in the U.S. so we almost missed our chance to speak at the International Philosophers for Peace Conference. Luckily, we were able to make it for the last day and they were able to squeeze us in. We felt very rushed and a little on edge, but we able to present and it was a very good opportunity. On January 1 we were able to meet and spend time with the families at the dump. When we arrived, they had cleaned out a huge area for us and they had a small bicycle-wagon for us to sit on. They loved getting their pictures taken with our cameras. We were greeted as old friends with open arms. 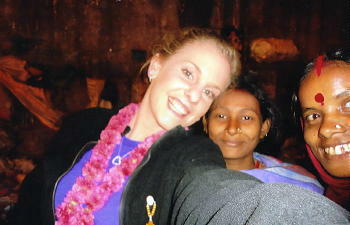 My favorite day was the day we were privileged to visit the peoples' village. It was so unreal. I felt like I was in a book. We took an hour and a half train ride, standing room only, because it was so crowded. Although it was miserable being way too close to way too many sweaty people, I really enjoyed looking at the landscape of India out the window. When we finally arrived at our stop, we took a bicycle-wagon ride to the village. A poor teenage boy had to pull us with his bicycle on the wagon with 5 big bags! When we got to the village, the children put on a traditional welcome ceremony for us. We drew pictures, taught them how to braid necklaces and passed out a LOT of school supplies, toys, candy, etc. 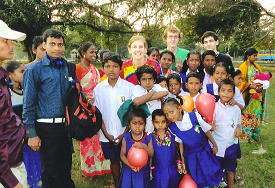 It was so great spending time with these precious little children. Our lunch at the village was my favorite thing we got to eat the whole trip. 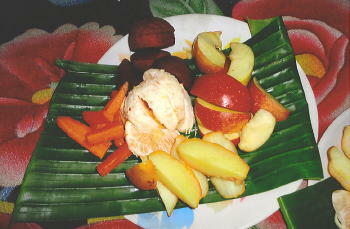 We had boiled water, carrots, apples, oranges, beets, and potatoes all grown in their gardens (so delicious!!) For dessert we had Indian coffee and butter cookies. After lunch, we had a big dance party! All the children were great little dancers and loved to show off their moves. Then they took us on a tour of their little village. They lived in mud huts with thatched roofs and baby chicks running all around. There was a small pond with a man making clay bricks. I sat and listened to the girls sing while Colin and Jorden ran around with the kids. Even though life must be very difficult, it was so nice and relaxing to get away from the busyness of the city's daily life. It was so wonderful to spend the day with such special little children. Me, Colin and Jorden at the Maiden with the kids and their families. Christopher is the one in blue. 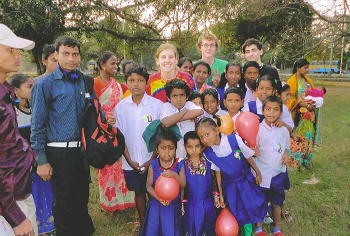 Our last day with the people, we brought them to the Kolkata Zoo. It was so exciting for them because they had never been allowed in before. It was dumb, because they were allowed in this time, because they were with us-"wealthy white Americans." At the Zoo, we taught them the animals in English and they taught us the animals in Bengali. My favorite was the baloo (bear.) After the zoo, we went to the maiden and taught them more English words. They picked it up really quickly and by the end, they knew more English words then I knew Bengali words and I had been studying Bengali for a month before the trip. It was amazing to spend time with such beautiful people. The energy and pure joy they have even though they have nothing was truly something I will never forget. They taught me way more then I could have ever dreamed to teach them. We had some good experiences and some not so good experiences, but I knew that it-was all part of the whole life experience. So I just went with it. It was awesome to be able to be apart of something bigger' then myself. I could not have made it out alive if on my own. God truly strengthened me through it all and to Him I give all the glory. I hope you'll be pleased to hear that your donation went to a few small experiences, but most went towards the children's education. 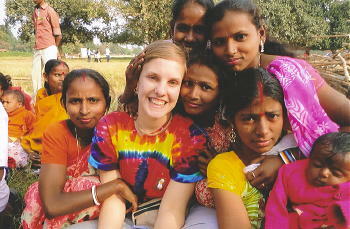 Forty-six Rupees in India is equal to one dollar in the U.S., so you truly made a difference. I just got you a little something to say thanks and to let you know that I was thinking' of ya!! I hope that all is well with you and yours. 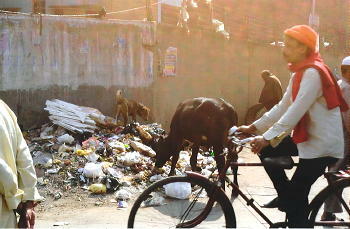 Cow and dog searching through a pile of trash for food.